Among a dozen specific spending and tax options for reducing the national debt and deficit, only three win majority approval from the public. They include: raising the tax rate on incomes over $250,000 (69% approve); limiting the amount of deductions a taxpayer can claim (54% approve); and raising the tax rate on investment income (52% approve). While limiting deductions overall receives majority support, fewer (41%) support limiting the home mortgage interest deduction. At the other end of the spectrum — cuts in federal funding for education, transportation and the poor are particularly unpopular. Fully 77% disapprove of cuts in education, 67% oppose reduced funding for roads and transportation and 58% disapprove of cuts in federal aid to the poor. In addition, 55% disapprove of reductions in military defense spending while 43% approve. There are substantial partisan differences over most of these proposals. Democrats are far more likely than Republicans to support reducing military defense spending and raising taxes on personal incomes over $250,000 and on investment income. A majority of Democrats (57%) approve of defense cuts, compared with 22% of Republicans. 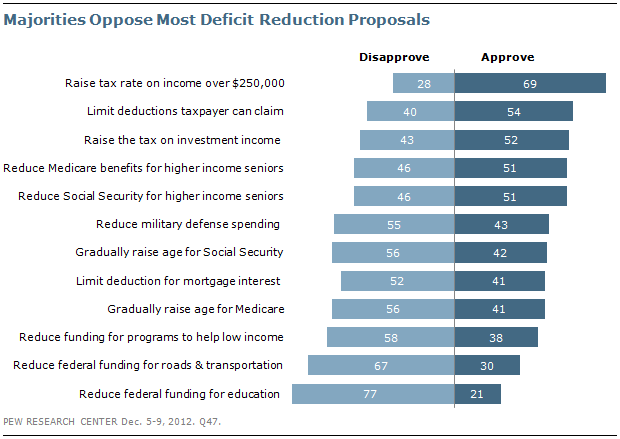 Similarly, fully 86% of Democrats support raising taxes on income over $250,000. Republicans are more divided; 52% approve of this while 44% disapprove. A majority of Democrats (62%) support increasing the tax rate on investment income while a majority of Republicans disapprove (60%).